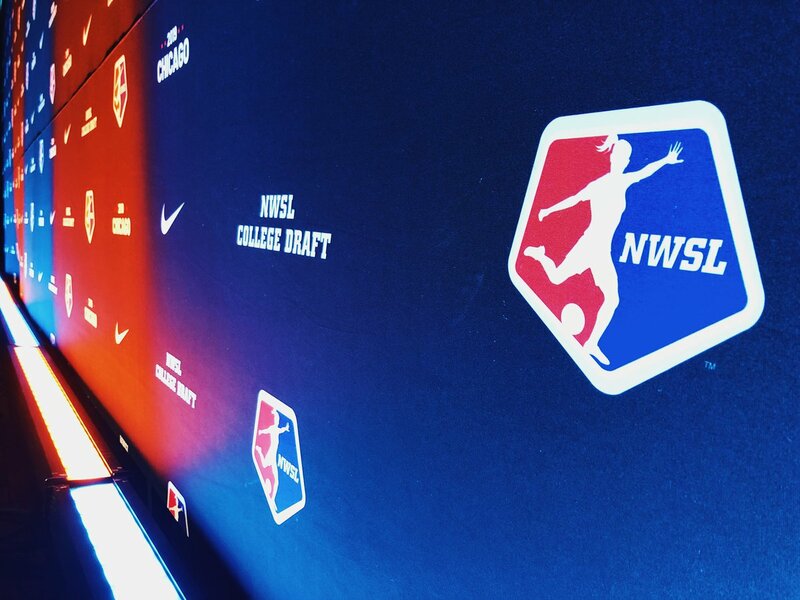 The 2019 NWSL College Draft is being held at the United Soccer Coaches Convention in Chicago, Illinois and will begin at 12:00 PM EST. We have now reached the end of the 2019 NWSL College Draft. Thanks for spending your time with me today. Until next year! The third round is done and dusted. One more round to go. The Thorns and the Red Stars have made a trade. Portland gets the 24th overall pick and the Red Stars now get the 31st and 35th overall picks. All the picks from the second round have been made. No. 17: With their newly acquired pick, the Spirit get Bayley Feist from Wake Forest University. Portland has traded away the 17th overall selection to Washington who have in turn, traded the 31st overall pick and a second-round pick in next year's draft. All smiles on Draft Day! And now the NWSL i.e. the league itself, has taken a timeout. Portland were next on the clock but they have taken a timeout too. The Red Stars have taken a timeout. The second round has started and we will keep updating as the picks come in. First round done. Here’s where we stand after the first nine picks of the 2019 #NWSLdraft. That's the end of the first round of the draft. We will be taking a short break before the next round begins. No. 9: Hailey Harbison (Pepperdine University) will be joining the Courage this season. The North Carolina Courage are next on the clock. No. 8: After a timeout, the Spirit select Dorian Bailey (University of North Carolina). Washington have another pick coming up. No. 7: Tegan McGrady (Stanford University) is finally selected by a team. She will be heading over to Washington. The Spirit are back on the clock. No. 6: Julia Ashley (University of North Carolina) is the next player to be selected this year. Sky Blue FC is now back on the clock. No. 5: Leah Pruitt (University of Southern California) has been selected by the Courage. The North Carolina Courage are now on the lock with the fifth overall pick in their sights. No. 4: Samantha Staab (Clemson University) is the next player to be selected by the Spirit. The Spirit are back in the clock. No. 3: Jordan DiBiasi (Stanford University) is the next player off the board. The Washington Spirit are now on the clock. Sky Blue FC and the Washington Spirit have made a trade. Washington now has the number three pick while Sky Blue will receive the 29th overall pick and some players to be named later. No. 2: Hallie Mace (University of Los Angeles - Berkley) has been selected by Sky Blue. Sky Blue FC is next on the board. No. 1: Tierna Davidson (Stanford University) is the first overall pick in the 2019 NWSL College Draft. The Chicago Red Stars are now on the clock. Now the acting NWSL Commissioner, Amanda Duffy, is addressing the audience as we await the draft to begin. Lesle Gallimore, the head coach University of Washington, is now at the podium and addressing to the audience. The draft is now live! The hosts for today will be Marisa Pilla, Jen Cooper and former USWNT player Lori Lindsey. Teams and their respective coaches are now settling in as we have roughly 15 minutes to go before the draft begins. Final thoughts before the draft goes live, I expect to see the Red Stars quite possible take Tierna Davidson as the first overall pick as the young star for the United States Women's National Team has declared herself eligible for the draft. The draft is set to start at 12:00PM ET and will be held at the United Soccer Coaches Convention in Chicago, Illinois. Fans can watch the draft on the National Women's Soccer League Facebook page, Youtube channel and on the NWSL website. With new coaches and a World Cup looming, teams in the National Women's Soccer League will want to make sure they get the best value possible during the draft as they know many of their senior players will be missing significant time during the summer. If done right, teams can keep themselves within playoff contention during those crucial months and have a platform ready to push off from once the national team players return. The Houston Dash and Portland Thorns FC only enter the draft in the second round unless they make moves to place themselves into the first round today, and the Orlando Pride and Utah Royals FC do not come into play until the third round. As of right now, Seattle Reign FC are the only team without a draft pick this year unless they also make some moves before or during the draft. Teams participated in trades yesterday and in previous seasons, which saw the draft order change many times. The final draft order sees the Chicago Red Stars having the No. 1 overall pick and then Sky Blue FC have the next two picks as well as the sixth overall pick. The Washington Spirit have the fourth, seventh and eighth overall picks, and the North Carolina Courage finishes off the first round with the fifth and ninth overall picks. With so many high profile collegiate players adding their name to this year's draft list, we can look forward to an interesting day of possible selections and trades. Good morning everyone to VAVEL USA's LIVE coverage of the 2019 NWSL College Draft. I am your host for the day, Kudzi Musarurwa. Hopefully you'll stay with me as we keep track of all the business being done on the draft floor and beyond once things get started.